Sylvia Chan-Malik spoke to the Rider community about Islamic feminism on March 26 in The Spitz. 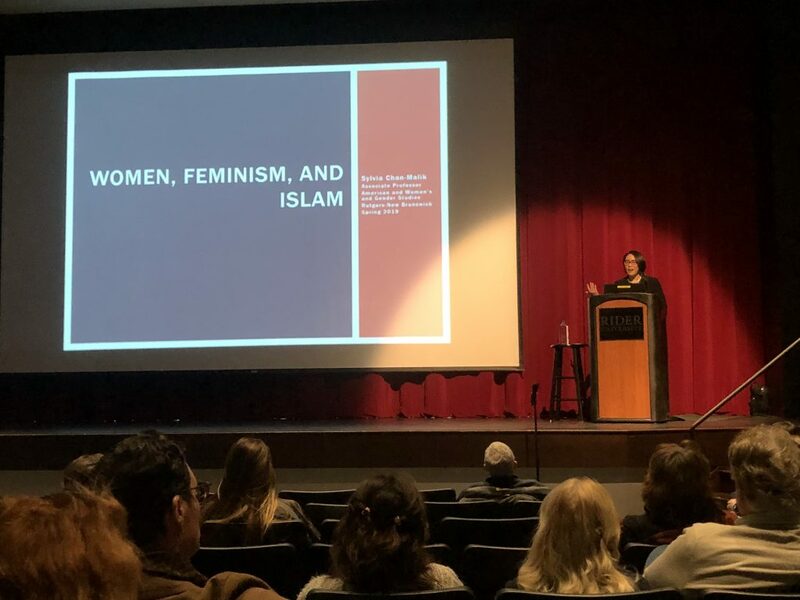 Sylvia Chan-Malik, an assistant gender studies professor at Rutgers University, gave a lecture, titled “Women, Feminism and Islam,” to the Rider community as part of the university’s effort to celebrate Women’s History Month on March 26. Chan-Malik noted that this topic is very broad and that the terms women, feminism and Islam can be explored in depth individually. Crediting the audience for knowing what the term “woman” meant, Chan-Malik gave an overview of feminism and Islam. Chan-Malik explained that, due to the various feminist phases throughout history, including the activism for women’s right to vote and women’s right to work post WWII, Americans view feminism differently from the rest of the world. These phases “emerged out of particular historical moment when women advocated for the right to work, equality, equal pay in the workplace, to choose in sexual autonomy,” said Chan-Malik. According to Chan-Malik, this framework has continued to define feminism in modern-day society. It is unclear whether the current realm of feminism is considered the third phase of feminism, which began in the early ’90s during the case regarding Anita Hill’s testimony of being sexually assaulted by Clarence Thomas and ultimately ignited awareness of sexual assault in relation to the workplace and intersectionality, or the fourth phase that involves social media activism and some individuals who claim that feminism is no longer needed, Chan-Malik said. Since feminism in the U.S. has experienced phases, it influencesAmericans to overlook and assume things about Islamic feminism, according to Chan-Malik. Islam is often misperceived as having patriarchal aspects, but according to Chan-Malik, many female Muslims identify as feminists. Muslims follow the teachings of the Quran and the Hadith and live by Sharia Law. Sharia Law is often perceived as a patriarchal entity. According to Chan-Malik, female Muslims, whether they were raised Muslim or converted later in life, are drawn to the Islamic faith because the teachings represent gender equality. Chan-Malik said that interpretation of these religious texts help female Muslims find empowerment. She also suggested that Islamic feminism differs from American feminism because it focuses on things according to the needs of their countries. Junior public relations major Melissa Indecere believes it is important for the Rider community to be exposed to feminism.